This page shows how the belt can be changed on a Walker-Turner 900 series drill press. These photos were taken during the process of a full restoration of a WT 936, which is a floor model drill press with a production table. The same process can be used on any 900-series machine. Walker-Turner 900 drill presses used at least two different designs for the upper bearing retainer that captures the bearing mounted on the top of the spindle pulley. One version uses a machined steel sleeve that slips snugly through the head casting from the top and captures the upper pulley bearing. One of these sleeves can be seen in the bottom right of the following parts photo. 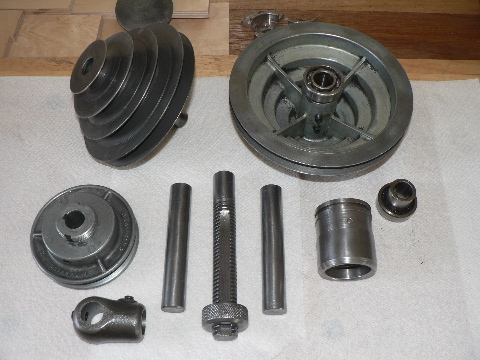 The other design, which is what exists on the machine used in this restoration and documentation, has an extended lower end of the spindle cap, which is a single piece that also serves as the upper bearing retainer. This type of spindle cap and bearing retainer can be seen in the upper portion of the following parts photo. A difficulty in the design of these drill presses, as well as some other manufacturers', is that when the spindle is installed, the spindle pulley is fully captive within the head casting, so a belt cannot simply be slipped over the top of the spindle pulley for installation. Some users get around this difficulty by installing link belts on their drill presses, which can be decoupled at a link, slid around the pulley, and reattached. Others have been able to successfully install a v-belt through the opening on the top of the head casting with the spindle still intact. The following approach, which shows how to drop the quill and spindle out of the head casting, takes about 15 minutes once you've done it a couple times and is what you would do if you're installing a belt as part of a broader machine restoration anyways. Start by removing the return spring cover, shown below. Remove the bolt or machine screw that attaches the cover to the casting, making sure not to let the cover itself work loose from its stationary position snug against the head. If you look closely at the edge of the cover, you'll see small notches in the cover that fit onto studs that are built into the casting. With a firm grip on the cover, gently pry it slightly away from the casting just enough for the notch to clear the stud. You will feel the tension of the spring working against your grip. Slowly allow the cover to rotate far enough to reengage the next stud in the alignment. Readjust your grip, and repeat the sequence of rotation until the entire tension has been released. When the tension is released and the cover is loose, you can see the end of the coil spring inside where it is attached via a keyslot that slips over a small tab that is screwed into the pinion shaft. Be careful not to allow the actual coil spring to slip out of the cover, or you will find yourself having all kinds of problems getting it back in sometime later when you're reinstalling everything. Slip the end of the coil spring off the tab, taking care not to snag or break the spring itself. If you find a WT 900 where the return spring seems not to work, it is often caused by a problem with this slot/tab intersection -- either it has slipped off or the spring itself may have been broken. It is possible to cut a new slot in the remaining end of the coil and reinstall. In any event, in this case the coil slot can be removed from the pinion tab and set aside. This is the inside of the return coil spring. This is the tab that screws into the pinion shaft. It should not be overly tight and should unscrew easily to remove. At this point, the pinion shaft is ready to be pulled out of the head casting in the direction of the handle. Before doing so, though, you need to ensure that it does not simply drop out of the head once the internal rack-and-pinion gearing is disengaged. Two approaches are recommended: locking the quill lock lever and raising the table up to where the chuck or spindle nose rests on the table. These can be moved later to allow control when removing the quill. Now you can gently pull the pinion out of the head casting towards the handle side, which also frees the quill to be removed. With a grip on the quill, swing the table out of the way and loosen the quill lock. The quill and spindle will slide downwards as far as you need to go. If you are removing the entire quill for clean-up or maintenance, it can come all the way out. If you are only changing the belt, it only needs to come far enough for the top of the spindle to open a gap above the upper bearing in the head casting. Slip a new belt through the gap above the upper bearing and let it drape free for later attachment to the motor pulley. This photo, obviously, was taken a couple steps later after the quill had been reinserted. Now it's a matter of reassembling the parts. Start by reinserting the quill and spindle assembly into the head casting, making sure to keep the rack of slots to the rear to connect with the pinion eventually. Lock the quill in place and gently slide the pinion shaft back through the casting. You may need to wiggle either or both the pinion and the quill to get the rack-and-pinion to engage. Make sure the pinion is fully inserted and seated in place. Once the pinion is reinstalled, the quill cannot fall back out the bottom. Screw in the little pinion tab that will hold the end of the spring coil. Sorry, no photos of the step for reinstalling the return spring coil or cover, but it's pretty straightforward. Carefully slip the keyslot in the spring coil over the pinion tab and rotate the cover by hand a little to engage it and keep it from slipping off. Then increase the tension on the return spring by reversing the process you used to remove it. Engage the notches and studs one at a time to gradually increase the tension on the spring. As the tension increases, you will see the quill gradually pull upwards into the retracted position in the head casting. Install the locking bolt to keep the spring cover from coming loose and test the quill stroke to see if there is sufficient tension to retract the quill after a downwards pull. You are likely to need to use trial-and-error to readjust the tension until the desired retraction strength is achieved. Congratulations. Now you're ready to reattach the new belt to the motor pulley and get back to work.